Playa Hotels & Resorts offers guests an array of luxury all-inclusive resort brands including Hyatt Zilara Cancun, Hyatt Zilara Rose Hall, Hyatt Ziva Rose Hall, Hyatt Ziva Puerto Vallarta, Hyatt Ziva Cancun, Hyatt Ziva Los Cabos, The Royal Playa del Carmen, Gran Caribe Resort and Gran Porto Resort, all located in some of the most popular destinations in Mexico & the Caribbean. 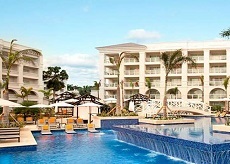 Smack center in Cancun's legendary Hotel Zone, all-inclusive and family-friendly Panama Jack Resorts Gran Caribe Cancun is a picture-perfect escape packed with unlimited fun in the sun for guests of all ages. 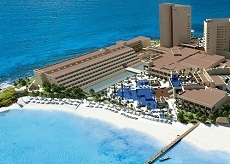 Situated on the widest stretch of beach in Zona Hotelera (Hotel Zone), Hyatt Zilara is an adults-only, all-inclusive resort in Cancun where guests experience traditional Mexican warmth in an intimate setting on the Caribbean Sea. 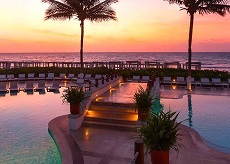 Hyatt Zilara Cancun offers a myriad of resort activities, including refined culinary experiences at six gourmet restaurants, DJ driven pool parties, and rejuvenating treatments at The Spa. For couples adventures, enjoy a romantic candlelight dinner on the beach, a massage on the clear-blue sea or a tequila tasting. Our luxury beachfront resort offers 6,888 square feet of meeting and event space, including a breathtaking beach and outdoor terraces, with personal event planners to assist you in creating your celebration in paradise. Hyatt Zilara Cancun is 15 minutes away from downtown's vibrant nightlife, 20 minutes from Cancun International Airport and moments away from spectacular golf courses, shopping, restaurants and nightlife in one of the most beautiful destinations on the planet. 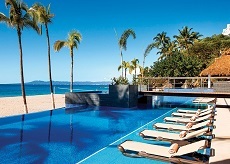 Enjoy a Caribbean escape to the sophisticated adults only Hyatt Zilara Rose Hall in Montego Bay, Jamaica. From the only Moroccan themed rooftop lounge, world-class Brazilian steakhouse, luxurious infinity pools, intimate ocean front fire pits, signature swim-up suites, and the best jerk chicken in Jamaica, we have it all. All bestowed with our genuine Service from the Heart. It begins with an idyllic destination, a Mayan-inspired oasis surrounded on three sides by Caribbean waters. Situated on Cancun's most desirable point, Hyatt Ziva Cancun provides the perfect backdrop for couples, families and groups to celebrate special occasions. Within this stunning resort lies a playground for innovative experiences, where swim-up suites overlook the ocean, a tequila sommelier teaches the art of sipping Mexico's traditional spirit, and a microbrewery serves its own hand-crafted beers. 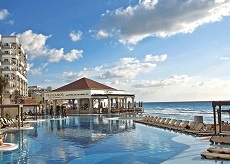 Such unique amenities paired with a vast selection of superb dining options and unparalleled accommodations make Hyatt Ziva Cancun an exceptional choice. It's all included, and it's all bestowed with our genuine Service from the Heart. More than any souvenir, more than any photo, it is the stories you bring back with you that make a vacation experience special. At Hyatt Ziva Los Cabos, unforgettable tales await around every corner. Surrounded by the quiet charm of the Baja peninsula and the Sea of Cortez, your story unfolds. Authentic guitar music floats on warm, gentle breezes. Sunlight dances on the slides of the resort's water park. The grill sizzles and the aroma of fresh seasonal recipes signal that great taste is always on the menu with dozens of options to choose from. All-suite accommodations invite relaxation with contemporary décor and convenient access to beaches and pools  including our signature swim-up suites. It is all included, and all bestowed with our genuine Service from the Heart. Situated on a beautiful secluded beach, our luxury all-inclusive resort in Puerto Vallarta is a spectacular all-ages oasis that captivates your senses. From relaxation at the Vita Mar spa to the lively pulse of nightly entertainment, Hyatt Ziva Puerto Vallarta lets you live in the moment. Boasting the region's most cloistered beach-cove, Hyatt Ziva creates the perfect ambiance for a romantic escape, a family vacation, or a special celebration. 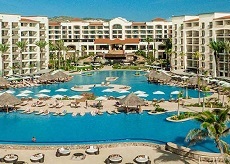 The architecturally inspired resort complements its dramatic setting and the colonial town of Puerto Vallarta. Tucked into a tropical paradise on Las Estacas Beach, Hyatt Ziva Puerto Vallarta is surrounded by the sparkling Pacific Ocean with stunning views from elegant suites. Watch the sunset while dining at celebrity chef inspired restaurants, or sip cocktails on the white sand beach under the shade of an umbrella. Soak up the warm Mexican sunshine by our five sparkling infinity pools and relax in the oversized infinity hot tub. If you're craving some serenity, dive into a good book at the adults-only quiet pool, while young vacationers play at the KidZ Club with 2 pools of their own and fun activities. Discover all 5 pools and understand The Evolution of All Inclusive. 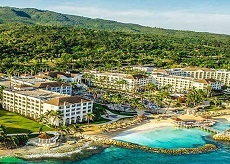 Hyatt Ziva Rose Hall features attentive beach and pool butlers, a Moroccan-themed rooftop lounge, sparkling pools, intimate oceanfront fire pits, and the best jerk chicken in Jamaica. Devoted to recreation and relaxation, guests are free to enjoy the best the island has to offer, from gourmet cuisine and spacious accommodations, to thrilling sports on land and sea. It's an experience every member of the family will enjoy. The Royal welcomes guests to a world of all-inclusive luxuries exclusively for adults. Situated on the Riviera Maya just steps from Playa del Carmen's famous Fifth Avenue, this resort features all-suite accommodations with private balconies and spectacular views, double jet whirlpool tubs, plus special options such as swim-up suites and beachfront walkouts. The attentive staff provides genuine hospitality at every turn as guests enjoy the luxurious spa, exquisite cuisine, natural beauty and many other delights.